Jahangir Askerov, CEO of Azerbaijan Airlines (AZAL), has held strategic talks with Richard Forson, president and CEO of partner airline Cargolux, in which both sides expressed their satisfaction with the 17-year cooperation between the two carriers. Their discussion also placed the spotlight on the need for the continuation of production of the iconic Boeing 747 widebody freighter, amid speculation that its manufacturing line may be scrapped by the US planemaker. The AZAL/Cargolux partnership, established in 2001 with the initial operation of regular Cargolux flights to and from Azerbaijan’s Heydar Aliyev international airport outside Baku, was further strengthened when both sides agreed a contract for Cargolux to deliver three Boeing 747-400 freighters to Azeri carrier Silk Way Airlines between 2010 and 2014. This arrangement currently also includes maintenance of Boeing 747 airliners, plus crew training on simulators for the type. 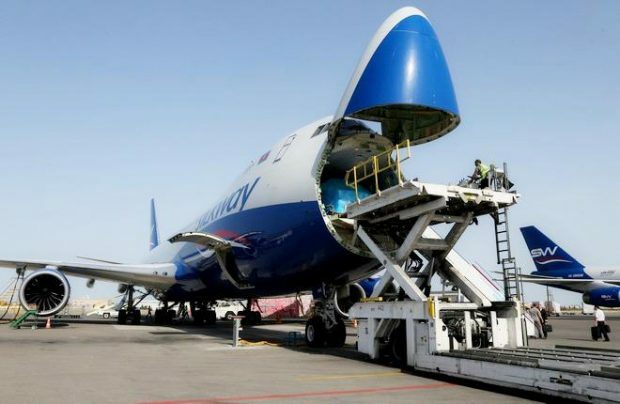 According to AZAL’s Askerov, Azerbaijan’s civil aviation has emerged as the foremost air carrier along the Great Silk Road connecting east and west, and the use of long-range Boeing 747-8F aircraft, now well established on the global cargo transportation market, is an important part of further implementation of this strategy. Askerov voiced his concerns about Boeing’s potential decision to shut down the 747-8F production line, especially because it is predicted that there could be a need to purchase some 20 such aircraft for Azerbaijan’s civil aviation within the next 10 years. This is why he intends to make a request to Boeing Corporation to continue production of the type. Richard Forson expressed Cargolux’s satisfaction with the high quality of services provided at Heydar Aliyev International Airport. He agreed that the 747-8F has more than proved itself in the world of air cargo transportation, and that there will be a continuing need for such aircraft on the market. Askerov informed his Cargolux counterpart that, at his invitation, Boeing Commercial Airplanes President and CEO Kevin McAllister will pay a working visit to Baku in the coming weeks. The invitation was extended to include Forson to participate in discussions regarding the future of the freighter widebody. Silk Way Airlines now operates regular flights to more than 20 destinations in Europe, Asia, the Middle East, and North America. The airline’s fleet consists of a mix of the modern and capacious Boeing 747-8F and -400F variants. Silk Way’s success over the past 10 years has helped Heydar Aliyev evolve into a major east-west logistics hub for air cargo transportation.